crowd after her qualifying run today. 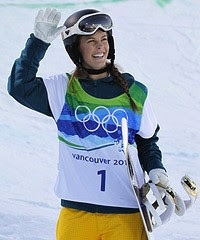 Olympic Women's Snowboarding finished the halfpipe event tonight with Australia's Torah Bright holding onto the top spot to take home the Gold Medal. Team USA was able to grab Silver and Bronze but there is a little bit of disappointment as stars Elena Height and Gretchen Blieler both had poor performances. American Hannah Teter surrendered first place, but the U.S. still managed two Olympic medals in the women's halfpipe on Thursday. American Kelly Clark took the bronze with a score of 42.2. U.S. hopes of sweeping the medals were dashed with poor performance by Elena Height and Gretchen Bleiler, who both fell on their two runs.